For the second straight year, O-Pee-Chee was the only major manufacturer of hockey cards after Topps declined to produce a set of its own. 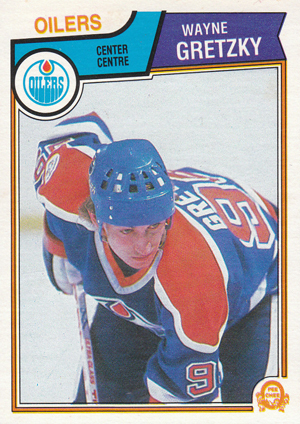 1983-84 O-Pee-Chee Hockey was a standard 396-card set with several specialty subsets and cards arranged by team. They did, however, try to incorporate more of a hockey motif into the design than what had been used in several years. 1983-84 O-Pee-Chee Hockey card fronts have a player photo that was usually taken on the ice during a game. Above the picture are elements designed to look like a hockey puck being struck by a stick. The puck-shaped circle contains the team logo, at the "stick" features the position rendered in two languages. The team name is above that, and a banner extending outward contains the player's name. An OPC logo appears in the lower right corner of the picture. The backs are oriented horizontally, with two graphic hockey players at the top. They are joined by a card number, the player's name, position and team name. A box on the left side contains a fact about the player in both English and French. The player's year-by-year playing statistics and a bilingual biography appear next to that in a different box. The player's vital stats run along the bottom. 1983-84 O-Pee-Chee Hockey cards are generally arranged in team order, with each team getting its own highlight and leaders cards. Cards 203 through 222 feature trophy winners from the previous season, record breakers and league leaders. There are also three checklist cards scattered through the set. The key rookies in the set include Pelle Lindbergh, Scott Stevens, Brian Bellows, Guy Charbonneau, Phil Housley, Steve Larmer, Brian Mullen, Mats Naslund and Bernie Nicholls. Underrated year as OPC was the only hockey cards produced that year. Lots of great Wayne Gretzky and Mark Messier cards. Both the Oilers and NY Islander had epic dynasty teams that year. Its a great set! 1983-84 OPC 217 Wayne Gretzky Edmonton Oilers! KSA 9 MINT! ONLY 13 PSA HIGHER!